It's hard to categorize rivalry games. With most other home matches, you can look at current form, statistics, injury reports, suspensions, and playing styles to come up with an idea how it might play out. Rivalries, however, don't care about records, form, or otherwise; the intensity is ramped up to an entirely different level. I felt a different energy when I entered Providence Park roughly 90 minutes ahead of the latest chapter of Timbers v. Whitecaps FC. While we've seen an increase in traveling fans that ventured to the Rose City from other cities, it's a different experience when you have a bigger contingent parked in the Southwest corner of the stadium. However, even this edition of the rivalry had its own differences that were made immediately apparent. There was only one section of seats roped off for the visitors from the North as section 223 had gold ropes around the various bench seats. I was used to seeing more travelers head down, but after the latest U.S. election and subsequent policy decisions by the current administration, the Southsiders, one of the best supporters' groups in MLS, made a decision not to organize travel for away matches. While there was still a big group of folks wearing blue and white shirts supporting their team, I guessed it was roughly 30 to 40 percent of the usual number that usually make the trip. I can certainly understand the rationale behind the decision and I respect the choice, especially considering the stories that continue to pour out about incidents at various border crossings. When you travel as a group, nobody wants to think about the possibility that one of your own might not be able to cross a border, much less return back to the original destination without concern. Our world has never been a simple place and we may not fully agree on everything policy wise, but it's safe to say that current events have changed how we all think about our world. For me, I had no concerns about traveling anywhere in the world within reason, but that's just not the case anymore. I always thought our governments should be working hard to bring groups together, not put up barriers in an attempt to pull them apart. 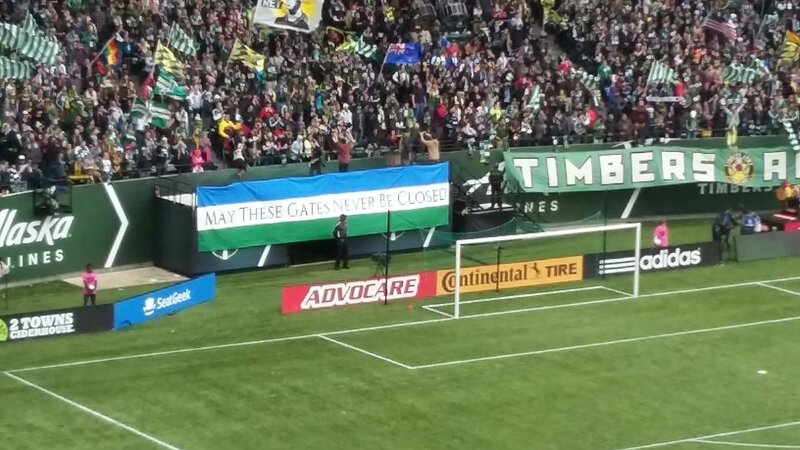 That's a big reason why I loved the Timbers Army banner unfurled before the match because it was the right sentiment for the right time. Pretty awesome message if you ask me. Once the game pleasantries got under way, the match devolved into a very typical Timbers - Caps affair - physical, chippy, tense with occasional bursts of speed and passing. My wife, Jennifer, remarked after the match how compacted both sides played for the entire game, and upon reflection, I had to agree with that thought. Neither side seemed willing to explore and push the width of the pitch with any regularity, instead choosing to keep the attack very centrally located. Perhaps this was by design, since both teams were playing 4 defender, 2 defensive midfielder, 3 attacking mids and 1 forward formations to start. I get that once the whistle blows, the actual positioning alters very quickly and there's often more attacking options flying into the respective boxes. However, the main focal point of the offense relies upon a single target forward to be a catalyst for the attack. Portland is fortunate to have one of the best forwards in MLS for that very purpose in Fanendo Adi, who excels at not only tracking down the ball but holding it in traffic and distributing under pressure. Without Adi, the task fell upon Darren Mattocks, who can be a very physical player despite his relatively slight build because of his leaping ability and lower center of gravity. The Timbers would need Diego Valeri and Darlington Nagbe to pick up some slack as well, but the plan took another turn when Timbers Coach Caleb Porter had to replace incumbent wing Sebastian Blanco with Dairon Asprilla. While Asprilla is very gifted offensively, his defensive tracking has always been a question mark, so with Blanco's availability limited due to a sore abdominal muscle, Asprilla would have to step up his two-way play. It would also be important for David Guzman and Diego Chara to patrol the middle and clog up any counter attacks where ever possible, and for the most part, they did that. Vancouver was really only able to get consistent pressure when they sent midfielder Christian Bolanos wide matched up with Timbers defender Alvas Powell. The combination created several free kicks for the Caps in great spots, plus Vancouver was awarded a penalty off a Powell hip check where Bolanos fell down awkwardly. In my opinion, Bolanos went to ground way too easily, but I'm not the one with the whistle - especially since the officiating blew a similar call minutes earlier when Caps defender Kendall Waston put Mattocks to the turf in the box on a crossing pass with an extended arm. Darlington Nagbe and Lawrence Olum get ready for action. But I don't want to get into another tangent complaining about the officiating, either. For the most part, I thought Center Official Chris Penso did reasonably well with one notable exception - consistency. Penso did present caution cards where appropriate, but on too many occasions, he did little to deter the Caps strategy of fouling either Diego as much as humanly possible. While he was correct to give the Timbers advantage on the play that sprung Mattocks for his goal in the 40th minute after Caps midfielder Andrew Jacobson destroyed Diego Chara in the center circle, he did little when Valeri was under constant harassment. I don't want matches to degrade into whistle fests, which was the case with Timbers - Sporting KC a few weeks ago, but one area that MLS officiating needs a lot of help with is calling the match consistently for both sides. I'm okay with them adjusting during the run of play, but too often, the calls seem to be uneven. And I'm not just talking about matches with the Timbers either, as I've watched enough other work this season to know that it's a problem. Valeri had to leave the match due to injury, and the situation is serious enough that he's not available for this weekend's big match at FC Dallas. Three Things I Liked: (1) The defense seemed more settled with Liam Ridgewell out there. I have been impressed with the work of Roy Miller over the past few weeks, so I was surprised that Porter chose to bench him for Ridgy to pair with Olum. Ridgewell's presence and organization really did keep the Timbers defense together for long stretches.. (2) Jeff Attinella is the real deal in goal. I'm not interested in starting a goalkeeper controversy here, but Attinella was a big reason why Real Salt Lake didn't lose much on defense when Nick Rimando was unavailable. I like Jake Gleeson, but having a veteran who can step in and make big plays - saving a penalty shot - is a huge luxury. (3) The Timbers depth came up big for them in this match. Porter was forced to make several changes in the starting eleven, but unlike other matches where the alterations seem to gum up the mix, the Timbers started out very well with Mattocks and Asprilla on the attack. The second half was a different story, but the Caps turned up the pressure. It was good to have these guys back for this one. Three Things I Didn't Like: (1) The Diegos assault. It did keep Vancouver in the match and really did neutralize Valeri to the point where he had to leave the match for injury, but honestly, I didn't like the sluggish approach of the Caps. (2) Kendall Waston. I get it, he's a very talented defender and a big physical presence. I thought that Ike Opara played with his arms up, however, until I saw Waston's repertoire. I understand that soccer is a physical game and contact is part of the play, but his effort pushed the boundaries in my opinion. (3) Can we have a match without the rain for once? I get it - Let It Rain, Let It Pour, Let the Portland Timbers score - and all, but at the same point, I'm just getting tired of the constant rain that has set about this area for Winter 2017. Fine, I've joined the get off my lawn brigade. Whatever. Evaluations: Jeff Attinella - 7: Solid debut with calm, cool, collected play. I can see why RSL really liked having him about. Vytas - 6: Good to have him back, but I could tell he was a bit rusty in game fitness. While I like Marco Farfan and his game, I liked having Vytas available simply for his experience. Liam Ridgewell - 6: Good to see his organization and presence, but too many cynical fouls in the second half for my liking. I'd like to see him avoid stupid plays more if possible. Lawrence Olum - 7: Solid work and held up very well defending and contributing to distribution. Alvas Powell - 5. Was challenged a lot all match and made some mistakes, but also made several good plays. I thought it evened out over the match. David Guzman - 6. Did well in his first Cascadia Cup match. Diego Chara - 7. Limited in his influence by the fouling, but had some good moments in transition. Diego Valeri - 8. Drew Vancouver's attention all match and was able to influence the game at times when he wasn't being pummled. Darlington Nagbe - 9. Playing better than I've seen him before, it's great to see him grow on the pitch. Dairon Asprilla - 6. Had a chance to add his name to the score sheet but ran past the ball. Otherwise, did reasonably well. Darren Mattocks - 5. Yes, he scored a goal but had too many turnovers and hesitations for my liking. I felt he was pressing too much instead of just playing. Subs: Sebastian Blanco - 5: Had some good work late to help the Timbers hold the lead. Jack Barmby - 5. Good work as well, despite Penso giving him a caution for a ticky tack foul trying to get out of the way.